Mideast Peace Deal 'Must Leave Israel With Security' Israeli Prime Minister Benjamin Netanyahu speaks before a joint meeting of Congress on Tuesday. Netanyahu gave a bit of a preview of his congressional address Monday night to more than 10,000 supporters at the annual conference of the pro-Israel lobby AIPAC. 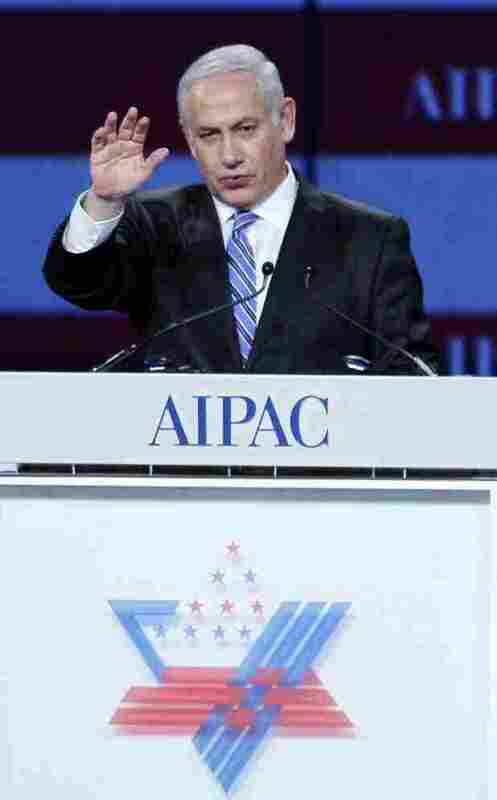 Israeli Prime Minister Benjamin Netanyahu speaks at the American Israel Public Affairs Committee (AIPAC) gala banquet in Washington, D.C., on Monday. He has promised to present his vision for Israeli-Palestinian peace in a speech before a joint meeting of Congress on Tuesday. Israeli Prime Minister Benjamin Netanyahu speaks before a joint meeting of Congress on Tuesday. He's promising to lay out a vision for peace with the Palestinians, but there are no signs that Israelis and Palestinians are ready to talk to each other. On the eve of his appearance before Congress, Netanyahu gave a bit of a preview to more than 10,000 supporters at the annual conference of the American Israel Public Affairs Committee, the pro-Israel lobby known as AIPAC. "I intend to speak the unvarnished truth, because now more than ever what we need is clarity," Netanyahu said. "Events in our region are finally opening people's eyes to a simple truth." Netanyahu had to pause several times as protesters who interrupted him were escorted out. "The problems of the region are not rooted in Israel," he went on to say. Peace with the Palestinians, he said, will not be a panacea for the region's troubles. Still, Netanyahu said he plans to outline to Congress what sort of deal Israel could accept. "It must leave Israel with security, and therefore, Israel cannot return to the indefensible 1967 lines," Netanyahu said. He confronted President Obama with that same argument last week at the White House, after the president said the 1967 lines — with agreed territorial swaps — should be the basis for negotiations. Former U.S. Rep. Robert Wexler (D-FL) says he has been surprised by Netanyahu's public squabble with Obama over that position. "The prime minister of Israel and the Israeli people may be better served accentuating that in which there is agreement with the United States and working hand in hand with the United States to present some kind of positive option rather than creating what appears to be unnecessary divide," he said. Wexler, who runs the S. Daniel Abraham Center for Middle East Peace, says if the prime minister would offer a new initiative, the U.S. would welcome it with open arms. But the gaps are vast. At the AIPAC meeting, former Bush administration official Elliott Abrams spoke at a panel on the Palestinians titled "An unwilling partner for peace?" He opened by stating that the answer to the question, "Does Israel have a partner for peace?" is: "No. Thank you very much." On the other hand, Palestinian activist Hanan Ashrawi told reporters in a conference call that Netanyahu has shown that he's no partner for peace. "Netanyahu is totally out of step with the times, totally out of step with the developments in the region, particularly the new Arab democratization and Arab awakening, and he is trying to hold the whole region back," Ashrawi said. That sentiment was echoed by protesters inside and outside the AIPAC conference. Jesse Bacon, with the group Young Jewish and Proud, said Netanyahu's policies are isolating Israel. "I'm sure he will be cheered and feted and all of that stuff," Bacon says. "But he's increasingly out of step with reality, at an increasingly greater cost — a loss of Israel's image in the world, and real consequences for Palestinians the longer this goes on. The longer they have to wait at checkpoints, the longer they have no democratic rights." Palestinians plan to go to the United Nations General Assembly in September to try to win diplomatic recognition for an independent state of Palestine. President Obama is warning the Palestinians against trying to "delegitimize Israel." But he hasn't been able to figure out a way to revive negotiations on Palestinian statehood. As for the president's recent speeches on the issue, Brian Katulis of the Center for American Progress compares them to "a psychologist holding up ink blots in front of a number of different people, trying to draw out and clarify what their views are and what their positions are." "And actually," Katulis says, "I think if that was the objective, mission accomplished." Israel's prime minister, he says, is digging in, and Palestinians are looking to the U.N.